Here is the “downtown” (so to speak) of the food-web. There are more than 1 million different species of different animals and plants and so to dedicate a post to each individual species, as you may imagine, is nearly impossible. Nonetheless, we’ve made posts for the most inquired animals. Some things to note as you broaden your knowledge on the food-chain as you read along is that I did not mention every single predator or prey to an animal. I may claim that one animal eats birds but so many species of birds exist so, if you need specifics, just make another search! 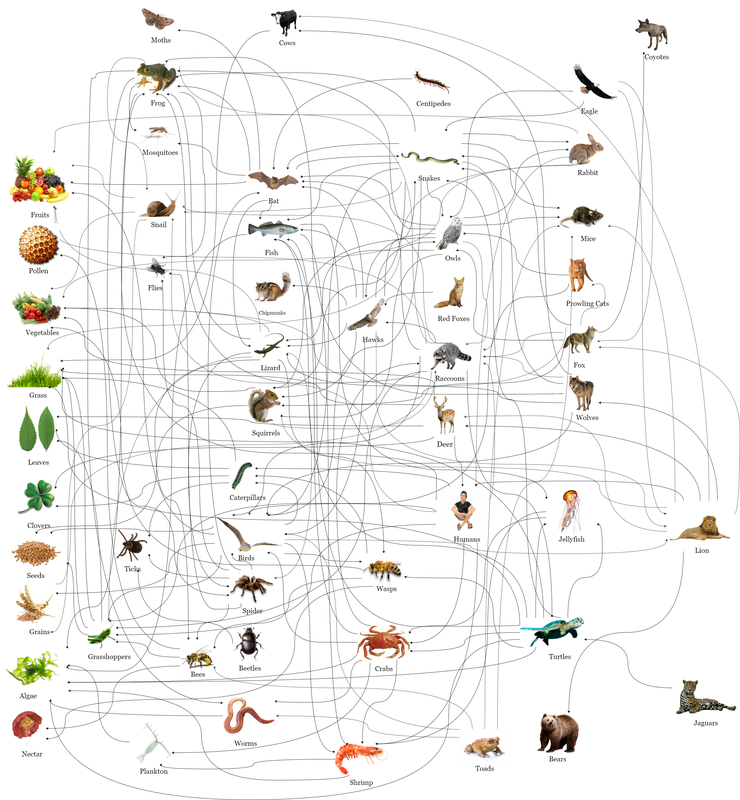 Below is a brief illustration on the food-web which shows you how complicated it really is (and can easily be more complex). Links to all our post related to the food-web will be placed just under it for your convenience. As I said, keep in mind that so many different species are constantly being discovered and there are too many subspecies for me to list as it is. Keep scrolling after our brief directory if you’d like for more tips and information on the relationship between predators and prey. Please include attribution to Alicia-Online with this graphic. As mentioned above, we will be offering more information to help guide you along this educational journey. So here it is. First off, humans have been known to negatively affect the ways of life for some time now. That is mainly due to deforestation so how the food web will look in 5 or 25 years from now can not be known. Alongside that, global warming is another partner in crime with deforestation and is augmenting to these changes. If you’d like to make a difference then do consider doing something to reverse one of the two (if not both). Secondly, aside from the fact that so many species exist, it’s good to note that I only mentioned the most popular food choices for animals. I did not list every single small thing a lion or raccoon may eat but the most common being they may prey on instead. Lastly, I did not get into small possibilities or coincidences that may happen. For example, if a hawk ended up deep in the ocean by some means and ate a fish it wasn’t supposed to, that was not mentioned (keep in mind this is a wild example but delivers my point).